Once again, your mission is to remove a cluster of same colored blocks, at least 3, but the more the better. As soon as these blocks have vanished, the blocks above of them will fall down and filling the gap. 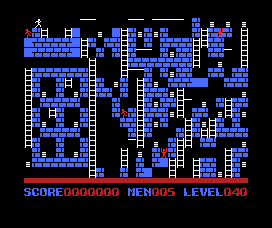 And while you remove blocks in the level, the game pumps new rows from the bottom in. So you must remove them faster as new rows appear and the blocks stacking up. Once all rows are in the game, you win. If one block reaches the top, you loose. 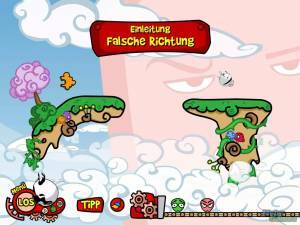 The game offers four different game modes: ZigZag, Big, Crunch, and Perplexor. Big is the classic Collapse mode. It works like explained above. New rows appearing without doing anything, so waiting too long can be fatal. 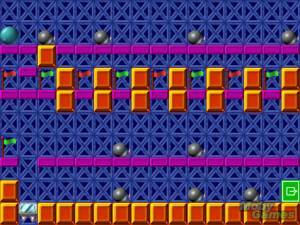 The speed of new rows increases from the beginning of the level to the end, but also the general speed from level to level. There are two possibilities for new rows: full 28 block rows or 14 block rows with a gap between each block. The gap will change the structure of the blocks in the game (while one vertical row stacks up, the other don't). There are Power-Ups in this game mode, which will help you, but can also hinder. This game mode is identical to Traditional from the predecessor, but is more then double the width, that's why it's called Big. ZigZag is a strategy variant, so new rows only appear when you clear a cluster. ZigZag is referring to the playfield, while the blocks in the other three game modes are ordered in a rectangle, this is ZigZag. Means: odd numbered vertical rows are like normal rows, while the even numbered vertical rows are shifted a half block up. For this game mode, you have infinite time for your movement. Perplexor is similar to the Puzzle Mode from the predecessor. You have to remove all blocks, if one remains, you loose. You also have so much time as you want. The greatest problem in this game mode is, that you can't use all of the blocks at the beginning. 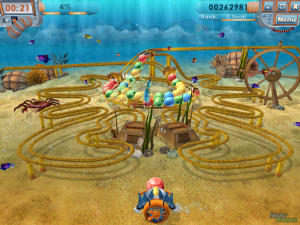 The playfield is divided into two different areas. The bottom area looks like in Big and works like in ZigZag. The upper part is partly hidden, but can't be used at all. Once you clear something in the bottom part, blocks from the upper part will drop down. Crunch is the most unique of the four. The playfield has blocks centered at the four edges. In the middle is a big mine, if the blocks hitting the mine, it's Game Over. Instead of putting new lines into the game, now it's just blocks. The new block feed will putting each by each counter-clockwise, moving the inner in one of the two possible directions (block feed from upper right corner will move inner blocks more left or down). So all blocks heading directly to the mine. Once you remove a block cluster, the blocks "beneath" of it will collapse in the direction of the nearest wall. While Big is speeding slowly up, this mode here speeds really fast up, putting multiple blocks in a single second in the game.